CAPACITY FOR 11,900 GALLON POOL: 155,000 Btu/hr will heat your ~11,900gal. pool to a comfortable temperature. HIGH QUALITY POLISHED STAINLESS STEEL 316L: Lesser quality materials can cause problems in your heating system, which is why we only use the best materials for our products. 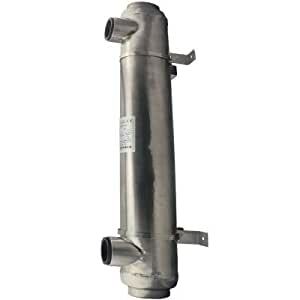 FREE 1.5 YEAR WARRANTY: Our swimming pool heat exchangers come with a 1.5 year warranty to cover manufacturer defects. Comes with 2x SS316L mounting brackets.